Hirelings: The Ascent társasjáték - Magyarország társasjáték keresője! A társasjáték érték! A Hirelings: The Ascent egy kiváló társasjáték, 2 - 6 játékos részére, az átlagos játékidő rövid, csak 30 perc. A társas elsősorban gyerekeknek készült, akár már 7 éves kortól is játszható. A játékmenet erősen épít a forgass és mozgass mechanizmusra. Deep in the underground lair of the foul dragon Rovert is a vast treasure that had been sought by a group of the most daring adventurers. Valiantly they made their way down to depths of the Earth and readied themselves to defeat the dragon, hoping to earn glory and riches – but the mighty creature was waiting, breathing a blast of heat and fire upon them, leaving only their boots! No one will remember the tale of these unlucky heroes except the hapless group of awestruck hirelings now standing in Rovert's lair, frozen with fear. Feeling helpless as the dragon moves closer and curls his tail behind them, the survivors tremble. The snorting dragon crawls right up in front of them, but instead of breathing fire, it opens his mouth menacingly, as if to draw another breath – or maybe to eat them! At that moment, the bravest of the group yells, "Run!" 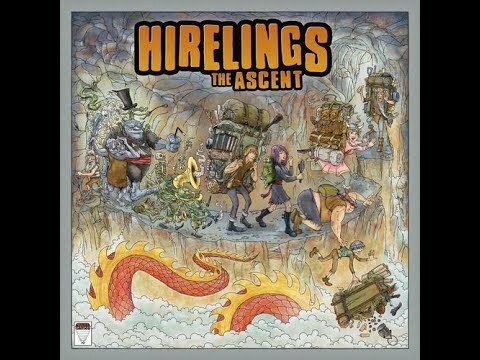 Hirelings: The Ascent is a board game for 2 to 6 players who become the frantic escapees, trying to find and fight their way back above ground. As a hapless hireling, will you be able to make it out? Can you win the game by being the first one out of danger?